Yvonne & I finished reading Harry Potter and the Half-Blood Prince last week. And as we’re no doubt the last 2 people in the English-speaking world to have finished it, I have no qualms about engaging in spoilers. 1. RAB: I think Paul is correct, RAB is Regulus Black. Question is, did he distroy the horcrux or not? The fact that he went looking for it at all, and that he apparently had turned against Voldemort, indicates to me that yes, he did destroy it. The other question is, is Regulus alive or dead? 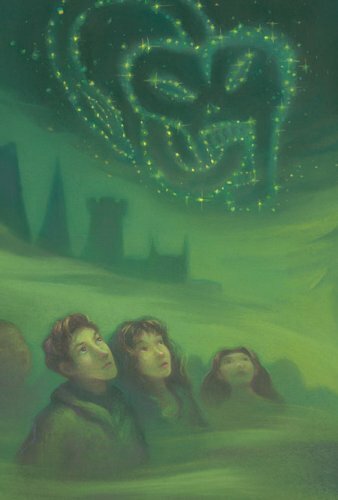 Laura suggested that the Mundungus Fletcher that we see absconding with the stuff from the Black residence – now Harry’s house – is actually Regulus posing as Mundungus, thanks to polyjuice potion. After all, if he had turned against V, he couldn’t exactly show his face in public. Plus the horcrux could have been in the house & he was trying to get to it before anyone else did. The only problem with this is, if Regulus is still alive, then Kreacher wouldn’t have to follow Harry’s orders. So I’m thinking that Regulus is dead & sometimes a Mundungus is just a Mundungus. On the other hand, is it possible for a house elf’s owner to give it an order to follow someone else’s order? 2. Dumbledore’s death / Snape’s betrayal: I don’t buy it. I think it’s a set-up between Dumbledore and Snape. That would account for D’s confidence when Harry rants to him about the whole Draco thing. Plus, D has never been wrong about anything in all 5 previous books & Harry has been; I just don’t believe that D would be wrong about something this big. Especially not if it puts Harry in the position of getting to think “oh, no one listened to me, I was right all along, boo hoo.” Or rather, not if it allows Harry to think this and be right. Every time Harry acts self-indulgent in these books he ends up being dead wrong – witness, for example, all of book 5. Of course, Laura thinks I’m in denial. That said though, I have no trouble believing that Rowling would kill off D. It seems to me that she’s been setting him up as less and less central for several books now. Plus Harry needs to break out on his own eventually, which he seems to be doing at the end. Even if he is Dumbledore’s man to the core. Another possibility is that D was killed & that it wasn’t Snape, it was someone else impersonating Snape using polyjuice potion. Or it was Snape, under the imperius curse. 3. Where is the final horcrux? Again, with Paul, I suspect in Harry. Specifically, I suspect in his head, maybe in his scar? After all, the Sorting Hat did want to put him in Slytherin in book one, & said something about it all being in his head. I took that to mean that the Sorting Hat knew he was a parselmouth, but there could be more to it. I suspect this also means that Harry will die at the end of book 7: he’ll sacrifice himself to destroy the last horcrux and save the world. Ah! I loved the book! And I cried! It was so sad! As for the whole Snape killing Dumbledore thing, if it was someone else impersonating Snape, then what was all that talk in the beginning Bellatrix and Draco’s mom begging Snape to protect his son?? Do you think Snape was under the imperius curse then? ?